Lease or Sell Your Mineral Rights in the Powder River Basin of Wyoming, Sell Working Interest in Wyoming’s Powder River Basin. Mineral Owners & Working Interest Owners wanting to sell Mineral Rights, Royalties, Working Interest or ORRI in Wyoming’s Powder River Basin, please consider 1280 Royalties, LLC. 1280 Royalties, LLC can provide you with an evaluation and offer for your mineral rights, royalties and working interest. We are offering to lease Mineral Rights within the perspective counties in the Powder River Basin as well as purchase AFE’s and Leases. There are numerous reasons mineral owners might decide to sell their mineral rights. Visit 1280 Royalties, LLC’s website to see the most common reasons mineral owners decide to sell their mineral rights in the Powder River Basin. You can have your Powder River Basin Mineral Rights and Royalties evaluated by our in-house team of professionals to assist you in making the right decision. If you’re looking to Sell Mineral Rights in the Powder River Basin of Wyoming, 1280 Royalties, LLC is an ideal option. 1280 Royalties, LLC can provide you with the proper evaluation you need to determine if now is the time to Divest Your Mineral Rights. Evaluating your mineral rights involves determining their current value based upon the future estimated ultimate recovery of the fossil fuels associated with your mineral rights. An economic summary of your mineral rights will be submitted for your consideration. Call us today if you are wanting to Sell or Lease your Mineral Rights in the Powder River Basin, request a bid today. The Powder River Basin is a geologic structural basin in southeast Montana and northeast Wyoming, about 120 miles (190 km) east to west and 200 miles (320 km) north to south, known for its coal deposits. The region supplies about 40 percent of coal in the United States. It is both a topographic drainage and geologic structural basin. The basin is so named because it is drained by the Powder River, although it is also drained in part by the Cheyenne River, Tongue River, Bighorn River,Little Missouri River, Platte River, and their tributaries. The majority of the coal mined in the Powder River Basin is part of the Fort Union Formation (Paleocene), with the low sulfur and ash content of the coal in the region making it very desirable. Coal supplies about half of the United States‘ electricity supplies, with the Powder River Basin mines supplying around 40 percent of the coal that fuels those stations, mainly to the east of the Rocky Mountains, for generating electricity. As of 2013 five coal export terminals were being proposed in the Pacific Northwest to export coal from the Powder River Basin to China and other Asian markets. Drax Power Station, Selby, United Kingdom. Trials are ongoing with a UK sourced Bituminous Coal, blended to increase CV. Recent controversy surrounds the extensive coalbed methane extraction in the region. In the last decade, nearly 7000 such wells have been drilled. An extensive network of gas pipeplines connecting these wells has been built, along with a series of pressurization plants, as well as power lines to provide electricity to operate the system. In addition, thousands of miles of new access roads have been constructed. Extracting the gas requires that water be pumped to the surface to release gas trapped in the coal seam. While some of the water is successfully utilized in agriculture production such as livestock water and crop irrigation, some waters are naturally high in salinity and sodium adsorption ratio. There has been controversy on how to best manage these saline waters. In 2007, Powder River Basin coalbed field produced 442 billion cubic feet of gas, making the field the 3rd largest source of natural gas in the United States. The region also contains major deposits of uranium, contained in sandstones. (See Uranium mining in Wyoming). The Wasatch Formation (Eocene) contains the uranium ore “roll front” type deposits found in the Pumpkin Buttes District. Cameco Corporation subsidiary Power Resources Inc. operates uranium mines in the basin. In Spring 2005, coal extracted from the mines would retail at the mines for around $5 a ton. However, power stations and plants in the eastern United States were paying over $30 a ton – the difference caused by the cost of transportation. (In October 2008, the mine-mouth price of Powder River Basin coal was closer to $15 per ton.) To transport coal from the basin, there is a joint railway line owned by the BNSF Railway and the Union Pacific Railroad running the length of the southern section of the Powder River Basin, including the climb over Crawford Hill, Nebraska. A third railroad, the Dakota, Minnesota and Eastern Railroad, faced strong resistance from many parties for its attempts to extend its rail line into the coal mining area, but while the plan was eventually approved by regulating authorities, the project was abandoned after the railroad was purchased by the Canadian Pacific Railway. Originally a single track Burlington Northern Railway line built in stages from 1972 to 1979, the rail line ran south from Donkey Junction in the north 13 miles (21 km) to Caballo, Wyoming; and then for 103 miles (166 km) to Shawnee in Converse County. The Chicago and North Western Railway ran close to the northern section, as did the Union Pacific at Caballo. Having already formed the Western Railroad to distribute the coal, in 1982 C&NW and the UP formed Western Railroad Properties, Inc. (WRPI), to acquire half interest in the Burlington Northern coal line from Shawnee Junction to Coal Creek Junction. On December 15, 1986 WPRI purchased 11 miles (18 km) more of BN line from Coal Creek Junction to East Caballo Junction. Beginning June 27, 1983 WPRI constructed six miles (10 km) of new railroad from Shawnee Junction. to Shawnee, rebuilt 45 miles (72 km) of C&NW line from Shawnee to Crandall and 56 miles (90 km) of new railroad from Crandall to Joyce, Nebraska. The first commercial train ran on August 16, 1984. By 1985, the line was single track for almost its entire length, and it was handling 19 million tons of coal. The implementation of the second stage of the Clean Air Act (1990) caused demand for clean coal to rise quickly. The C&NW struggled to upgrade capacity to dual track, resulting in numerous failures on the line in 1994, and eventually Union Pacific’s purchase of C&NW in 1995. The UP spent 855 million dollars over the next five years expanding capacity over its entire network to handle coal shipments from the PRB. By 2005 the Joint Line capacity had grown to handle an all-time record 325 million tons, and was either dual or three track capacity for its entire length. Due to various trackage and locomotive failures on the Joint Line in late 2004 and early 2005, the line failed to deliver the amount of contracted coal supplies, and electricity rates increased by 15 percent. Coal customers threatened to evaluate alternate sources of energy and transportation, including the Arkansas Electric Cooperative Corporation. As a result, the 280-mile (450 km) expansion of the Dakota, Minnesota and Eastern Railroad line was approved by the Surface Transportation Board. In 2006 UP and BNSF announced a $100 million investment to provide three track capacity for the entire length of the Joint Line plus a fourth track added over the steepest sections, including Logan Hill. These improvements will enable the Joint Line to handle over 400 million tons of coal. Presently more than eighty train loads of coal, which vary in size from 125 to 150 cars, are shipped from southern PRB mines each day. In 2006, Union Pacific set a record by hauling 194 million tons of coal – an 8% increase compared with 2005 tonnage. The company achieved this by increasing train size, with trains averaging more than 15,000 tons, a 200-ton weight increase compared with fourth-quarter 2005’s average. According to the BNSF 2008 Annual Report, the quadruple track project was completed. 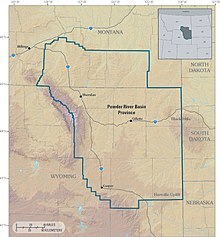 In 2009, the America’s Power Factuality Tour stopped at the Powder River Basin to report on its role in generating electricity in the US. ^ a b “America’s Power Factuality Tour 2009”. Retrieved 2009-08-27. ^ N. R. Jones and others, “Wyoming,” Mining Engineering, May 2008, p.134. ^ E. Freme, Coal review, Mining Engineering, May 2007, p.52. ^ James A. Luppens, David C. Scott, Jon E. Haacke, Lee M. Osmonson, Timothy J. Rohrbacher, and Margaret S. Ellis. “Assessment of Coal Geology, Resources, and Reserves in the Gillette Coalfield, Powder River Basin, Wyoming”. ^ a b “U.S. Coal Supply and Demand”. Energy Information Administration. ^ Phuong Le (March 25, 2013). “NW governors ask White House to exam coal exports”. The San Francisco Chronicle. Associated Press. Retrieved March 26, 2013. ^ Gordon L. Dolton, James E. Fox, and Jerry L. Clayton, (1990) Petroleum Geology of the Powder River Basin, Wyoming and Montana, US Geological Survey, Open-File Report 88-450 P.
^ US Energy Information Administration, Top 100 oil and gas fields, PDF file, retrieved 18 February 2009. ^ “Coal News and Markets”. United States Energy Information Administration. 2008-10-14. Retrieved 2008-10-17. This page was last modified on 1 June 2013 at 03:29.